Based on our research conducted on November 24, 2017, Roku currently owns 44 issued US patents, and 39 published, pending US patent applications. The difference between the 39 published applications that we identified and the 56 figure listed in the S-1 may be due to the fact many of the patent applications have not been published yet. The issued patents consist of 33 utility patents, and 11 design patents, with the earliest priority years for the utility patents dating back to 2011. Two design patents, USD546337S1 and USD558781S1, have priority dates of 2003 and 2005, respectively. This is interesting, given that Roku’s first video receiver box, the Roku DVP, was not commercially available until 2008. The patent data indicates that the company may have been developing its platform for years prior to its first product launch, possibly in stealth mode. 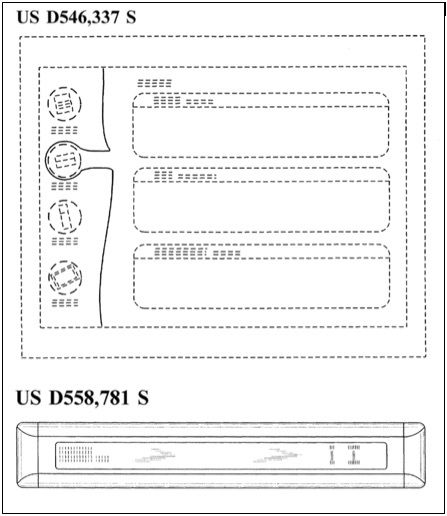 Below are excerpts from these two design patents showing Roku’s first user interface and box designs. Given that Roku aims to offer personalized content and user experiences, we were surprised that only a handful of its patents discuss social networking or the use of social data in order to customize a user’s experience. Social-based personalization seems to be the cornerstone of much of today’s pervasive applications and systems. We analyzed Roku’s issued patents and published patent applications, and identified only two references mentioning the use of social networking or social technology. Roku’s patents focus primarily on customization based on prior user history and demographic information, as well as user supplied preferences. The portfolio covers various aspects of Roku’s streaming platform, from its set-top device and hand-held controller hardware, to software related to on-screen guides, multimedia searching, sharing multimedia and content, closed captioning, and customization features such as content prioritization and user interface layouts. Another interesting note is that Roku’s US patent portfolio appears to be entirely organic, and the company has not acquired any third-party patents. This is in stark contrast to companies such as Twitter, Facebook, and Snap, which had amassed large patent portfolios primarily via acquisitions around the time of their respective IPOs. The bulk of these acquisitions were made from IBM. We reported in September that Hulu acquired over 50 patents from IBM recently related to audio and video streaming, DVR technology, and video coding. In addition, Rovi acquired a patent from IBM recently as well related to on-demand streaming. We would not be surprised if Roku seeks to acquire third-party patents, possibly from companies such as IBM, Hewlett-Packard, Panasonic, NEC, Sony, and others which have large patent portfolios related to video and audio transmission, multimedia streaming, and cloud storage. We expect Roku to continue its trend of aggressively filing patent applications for its in-house platform development. Given its influx of cash post-IPO, the company may focus on strategic patent and technology acquisitions to increase its product and feature offerings, versus large scale bulk patent portfolio purchases in light of its current license with TiVo.